Tennsco SRS721872AMG Sixteen Compartment Medium Gray Steel Locker with Coat Bar - 72" x 18"
Tennsco CLB1218MG Single Stack Gray Steel Locker Base - 12" x 18"
Hi, this is John Criswell. Welcome to Manufacturing Marvels. If you've got something to store or file, tennsco has the solution. For over 50 years, the tennsco corporation has made industrial and commercial storage and filing systems which are asked for by name. Tennsco calls Dixon, Tennessee its home, and is proud to manufacture its products right here in the USA. With 7 plants and over 1.5 million square feet of manufacturing space, tennsco has the capability to build it better,. The company not only offers a wide variety of storage systems, but also makes steel office furniture. Industrial and institutional shelving, lockers, and shop equipment. 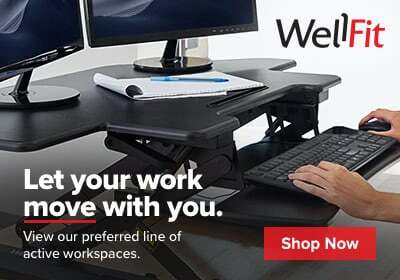 Everything is top-quality, built to be easy to stall, convenient to use and reconfigure. Tennsco can customize products to fit each customer's unique needs. Product design and shelving layouts come to life using can systems. This is where strength, space, and accessibility are engineered. In-house tool design and construction means no outsourcing and greater quality control. The latest in automation and robotics are used in manufacturing first class products at a lower cost for the customer. Large coils of steel are transformed through state of the art stamping, forming, welding, painting, and assembly operations into a wide arrangement of storage and filing solutions. These products are coated with a long-lasting power paint, or electro deposition finish. Tennsco has won multiple awards for its environmental stewardship efforts, including awards for energy efficiency, hazardous waste management, air quality, and environment. To learn more about tennsco, visit its website at tennsco.com. This is John Criswell for Manufacturing Marvels. Tennsco makes a variety of high-quality products in the USA, and has won awards for their operations. Tennsco lockers: systems for success. Hi, I'm Nicole and today i'm going to share with you the many features and benefits of tennsco steel lockers. For nearly 50 years we've worked to maintain our reputation as a premier manufacturer and supplier of industrial and institutional steel locker solutions. In fact, our customers tell us they turn to tennsco time and again because they trust we'll provide quality construction, attractive design, and unsurpassed durability. Let's take a closer look at some of the distinctive features of some of tennsco's top-selling steel lockers. In the industry, our lockers are known as the strong and silent type. Our single, double, triple tier, and box lockers are extremely tough with welded bodies and full length steel door stiffeners that enhance rigidity. They are also designed to include a variety of noise-inducing features. For example, strategically placed rubber bumpers virtually eliminate noisy clanking and banging of traditional steel locker doors. Doors also open and close quietly thanks to a spring-activated nylon latch and a plastic T that covers the latch. Steel lockers are available in one wide and three wide. Single tier lockers also feature a built in hat shelf, ideal for personal storage of hats, gloves, books, and more. Single tier lockers also include three coat hooks for opening, plus coat rods on 18" and deeper. Tennsco's quiet lockers also incorporate innovative design elements for added security. Fr example, the sturdy recessed door handle on all lockers except box lockers is vandal-resistant. a 3 point latching system on single tier, and a 2 point latching system on double and triple tier protects the doors full length. And a positive latching mechanism ensures the door is shut tight. Double leaf hinges with secured pins further enhance protection and durability. And unlike other manufacturers, when you order our lockers assembled, you're getting a fully-welded body. For added savings, lockers are also available assembled. You can choose from a wide variety of locker sizes and design combinations. Lockers are also available with and without legs. And because color is an important element in every interior setting, in addition to our standard offering, we offering a rich palette of premium and standard match colors at an additional charge. Our box locker is an affordable solution when you need space for shoes, purses, lunches, etc. Tennsco also offers lockers with ventilation panels that ensure continuous airflow on all three sides. Another door option includes our see-through door, constructed with secure Plexiglas to reveal the contents of the locker without having to open it. Whether you seek all purpose or customized locker solutions for office, industrial, educational, pharmaceutical, or general storage: tennsco will meet your needs. Tennsco offers a wide variety of durable and versatile lockers for any space! 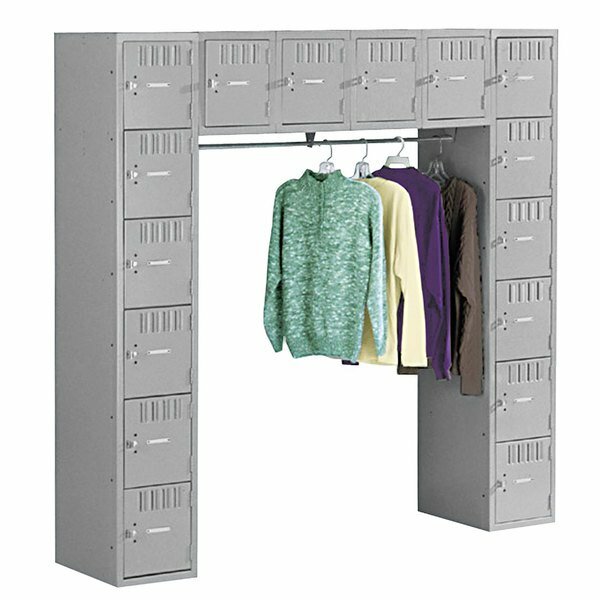 Give your employees or patrons a place to safely and securely store their personal items and hang their coats with the Tennsco SRS721872AMG sixteen compartment medium gray steel locker! Made of durable, heavy gauge steel, this locker is built tough and will hold up well to wear and tear. Perfect for either a breakroom or locker room, this locker provides plenty of space for storage and includes a number plate for clear and quick identification. Vertical louvers on each door promote proper ventilation so that air and odors are not trapped. For security, the door includes a padlock hasp that can optionally be used to prevent any possible tampering or theft. Full-length door stiffeners prevent flexing in the door and make for more quiet opening and closing. So your employees or patrons do not have to stuff their coats into their lockers, a convenient 48" coat bar allows them to hang them up. This unit can be raised up with a compatible base (sold separately) to give easier access to the lower compartments and protect contents from potential moisture. This item is made from a percentage of post-consumer content to help promote a sustainable environment.